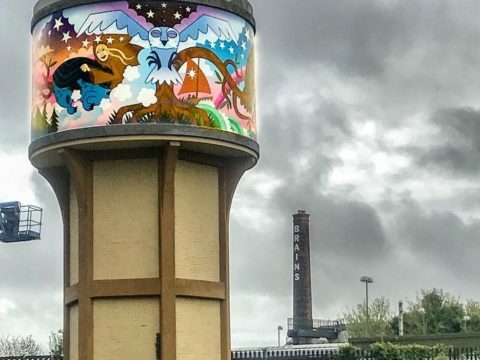 This stunning mural by Pete Fowler draws on some of the strange and fantastic stories from Wales and is mounted on the 1932 grade II listed Great Western Railway Water Tower. 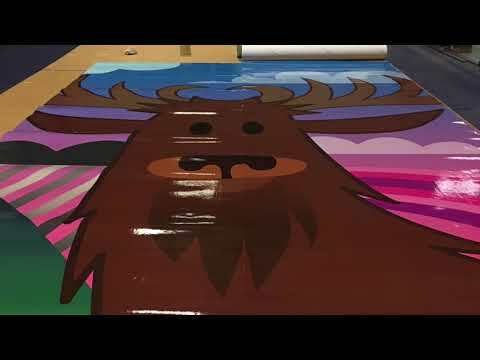 The mural comprises images particularly inspired by The Mabinogion; the ancient oral stories of Wales which were written down in the Middle Ages. We have the giant Bendigeidfran ('Blessed Crow’) - King of Britain – who fought the Irish and whose severed head talked to his men for eighty-seven years. We have Blodeuwedd, who was conjured from flowers by two magicians as a wife for Lleu, but was transformed again into an owl as punishment for trying to murder her husband. There is the goddess Rhiannon, who rides her horse better and stronger than the best horsemen of Pwyll, Lord of Dyfed. There is the noble stag, slain by the ghostly hounds of Arawn – Lord of Annwn (the Otherworld). And we have the crow, which features throughout the stories as a harbinger of death. A limited edition print run of 200 has been commissioned. Cardiff Water Tower Mural, signed by Pete Fowler, is available framed and unframed, size - 1200 mm x 400 mm. Profits will be used for creative workshops with marginalised communities. Images: Unframed 1; Unframed 2; Unframed 3. Order below. Dispatch will take place within 2 weeks of purchase. Please state the delivery address when ordering. 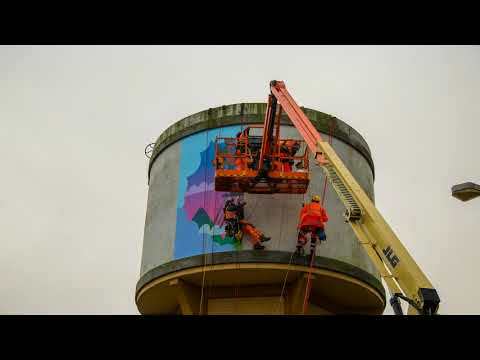 Enquiries to post@literaturewales.org marked 'Cardiff Water Tower Mural'.